From Real Clear Politics, it was easy to spot an eye-catching headline, Hindus for Donald Trump, in Google News. Clearly, the article contains enlightening comments – salient insights about four-million Hindus with roots from India who live and prosper in the United States. And why they supported Donald Trump for President. “There are many reasons to back the Republican Party, foremost of which is its embrace of traditional values – values shared by the Hindu family,” wrote Shalabh “Shalli” Kumar on July 23, 2016. A representative of four-million Hindus, Mr. Kumar is chairman of the Republican Hindu Coalition. “We as a people, and I as businessman, believe that both material and spiritual human prosperity come from a system in which individuals are free to pursue their dreams and aspirations, where private enterprise creates economic expansion and jobs, and where government involvement in the lives of the citizenry is limited,” he explains. “Human development comes from individuals, families and communities, and not from government, which only spends taxpayers’ money without much regard for its value,” adds the spokesperson. Mr. Kumar points out that Hindus have the highest per-capita income than any other minority group. “We also have the highest average education levels, the highest proportion of people employed as managers, the highest number of entrepreneurs (one in seven), the largest donations to charity, and are the least dependent on government,” he writes. He has special praise for Mr. Trump. “Inflammatory comments are often attributed to Donald Trump. As Hindu-Americans and ethnic minorities, we should be neither surprised nor offended,” he explains. “These statements, in many cases, come from a place of truth – we do have bad trade deals that benefit everyone but our allies and us. Trump is right, and although the media doesn’t often give credit to the complex positions he so often represents in simple and plain speech, I do,” he writes. “Self-sufficiency is a given in our community, and we don’t spend more than we earn. 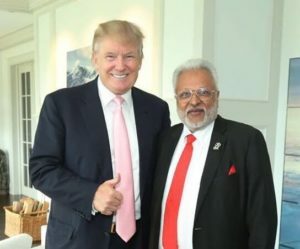 Hindu-Americans pay almost $50 billion per year in taxes, and we expect the government to be as judicious with its income as we are as individuals,” asserts Mr. Kumar. “Although there are many problems with the public education system in this country, lack of access for minorities is not one. The access is there. Most Indian-Americans grow up attending urban public schools,” he writes. “Why is it, then, that Indian-Americans succeed in the very schools that others do not?” he asks. “It is the ethos of our culture. We eagerly take advantage of opportunities when they are presented. To us, this is a civic duty, and we as a people have a responsibility to the nation that has afforded us so many opportunities to better ourselves,” explains Mr. Shumar. “This obligation is represented in the Republican Party platform, while the Democratic Party platform focuses on ethnic victimhood,” as he indicts the Democrat approach. “I am also impressed that the Republican Party’s platform, which Trump greatly influenced, is incredibly pro-India. We members of the Indian diaspora must take a page from the Jewish community’s activism and recognize the righteousness that comes from allying with countries with a historical affinity toward democracy,” he admonishes. “We must support trade and strong relationships with countries that share our values as Americans. For the Jewish-American community, that is often promoting our relationship with the economic power of tiny Israel,” he points out. “For Hindu-Americans and Indian-Americans, that must mean supporting the United States’ strategic relationship with India. Unlike many other countries that have economic relationships with the United States, India rewards the American-Indian relationship through healthy trade without risk of military conflagration or rivalry,” exclaims Mr. Shumar. “In a world in which the U.S. economy is threatened by regional upheaval around the world, economic rivalry and bad trade deals with China – an issue on which I wholeheartedly side with Mr. Trump – India as a trading partner provides an economic alternative and increased diversity in investment in the global economy,” he states. “As China inaccurately blames the United States for subverting its expansionist policies against the Philippines, Indonesia, and other countries on the South China Sea, and as it increases its submarine activity in the Bay of Bengal, India has the potential to be one of our best trading partners,” asserts Mr. Shumar. “Moreover, the relationship is a healthy one, in which American and Indian engineers often work together to create new technology. I know this first-hand: my firm is an active participant in this trade,” he concludes. Tips to Develop Relationships with High Net Worth Prospects — In cultivating a great portfolio of clients, the key is to develop relationships with high net worth prospects. But first you have to decide on your best niche or niches.